Four crewmembers simulating a mission on Mars dealt with a real-life emergency late last month — a greenhouse fire so strong that flames reached at least 10 feet (3 meters) high. On Dec. 29, the first day of their mission, the crew noticed an unusual power surge in their habitat at the Mars Desert Research Station (MDRS), in the Utah desert near the small town of Hanksville. A few minutes later, somebody spotted smoke coming from the greenhouse. "This is a moment where instinct took over, the instinct of fight or flight, and we had fight," Orenstein told Space.com. "There really wasn't a question at the moment." It took the crew about half an hour to bring the fire under control. Orenstein and crew engineer Dmitry Smirnov used all available fire extinguishers on site, but even after the extinguishers were exhausted and the power cut, the fire was still not out. "We put out the rest by putting water on the flames," Orenstein recalled. The four-person crew was barely able to deal with the emergency, he added. "Six or seven [people], to me, seems realistic as the adequate number of people to handle a situation like this most effectively." The middle of the greenhouse, which was called the GreenHab, was destroyed. An investigation by the fire marshal determined two days later that an electrical heater caused the fire, which was ruled an accident. The heater was set up close to some wooden shelves that had likely dried out over more than 10 years of use, said Orenstein, who is also the volunteer MDRS GreenHab coordinator. 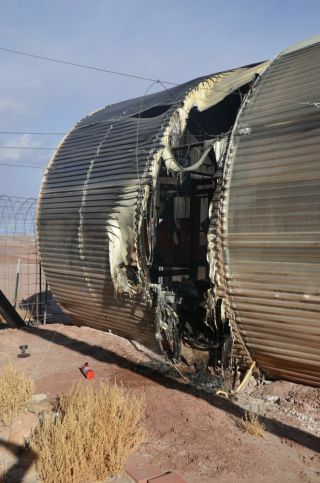 Damage inside the Mars Desert Research Station GreenHab following a fire on Dec. 29, 2014. In response to a 911 call, the Lane County sheriff came to MDRS later on Dec. 29, after the crew had successfully fought the fire. (The isolated location of the facility means it usually takes some time for emergency services to arrive.) The sheriff did a preliminary investigation and confirmed that nobody was hurt, Orenstein said. Orenstein's crew, the 146th one to use the habitat, decided it was best to stay in Hanksville temporarily, for two reasons — there were no fire extinguishers left at the research station, and there was some concern about chemical contamination in the habitat from the fire. "My responsibilities for the next few days were to look after the crew and to make sure that they were OK," Orenstein said. "Essentially, it was a post-tramautic stress therapy session there. We were making sure we were all OK, and looking out for each other." For the next two days, the crew commuted back and forth to MDRS and coordinated with emergency officials before deciding to end the simulation early, on Dec. 31. They drove back to the hotel in Grand Junction, Colorado, where they had met up before the simulation began. Two crewmembers went home, while Orenstein and Smirnov remained in Colorado for a couple of weeks. MDRS director Shannon Rupert and a few other MDRS officials did extra cleanup before the next crew arrived, and Orenstein went back to the facility briefly for the Crew 147 handover later in January. A temporary tentlike greenhouse is now available for experiments to go forward this season, Rupert added. "It's devastating because it's a loss of a functional component of the campus," Rupert told Space.com. "But it could have been so much worse. Everyone was safe. That was the main thing. Everybody got out." Crew 133 member Matthieu Komorowski inside the Mars Desert Research Station GreenHab in January 2014, about a year before the fire took place. Rupert said there is no estimate available for how much the GreenHab cost — it was funded and built by Explore Mars board member Gary Fisher — but she has been told a replacement structure would be worth at least $40,000. Rupert said she hopes to construct it for a quarter of the price using volunteer labor. Funding would come from donations from the nonprofit Mars Society, which runs MDRS. "The GreenHab as a greenhouse wasn't cost-effective; we had to keep it heated and cooled. The idea is this will be much easier to maintain," Rupert said. The Fisher GreenHab was the second greenhouse built at MDRS, after the first one collapsed under heavy winds. Built in 2003, the structure was first used for five years as an experimental water recycling system. The GreenHab was reconfigured in 2009 for use as a greenhouse, after concerns were raised that the water-recycling system would not be able to support crews properly. Crops for crews were grown for three seasons. A "Zen Garden" was also available for crews inside the GreenHab, allowing for a small spot to retreat from the main habitat for privacy. The Mars Society aims to have a replacement structure ready in time for the 2015-16 field season, which begins this fall.